Elizabeth and her three girls came in to the studio for updated family pictures and what they received were memories of a beautiful day and gorgeous portraits to display, gift, and cherish forever. Elizabeth was a little nervous at first to be in pictures herself. She was fine with the group shots, but to do it solo? Not so much. When she came for her reveal appointment, she cried happy tears and made sure she chose several images to keep of herself, for herself. 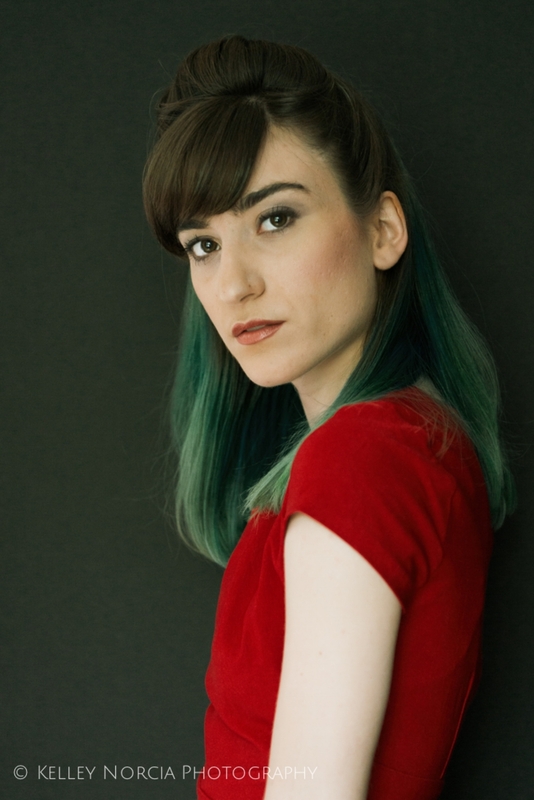 Hair and makeup by Traci Bellinger of Tres Bien Salon in New Haven, CT. Here are a few more from Maeve and Kiernan's photoshoot. So much fun! I love the last one and they were excited to pose for it and see it. Hair and makeup by Traci Bellinger of Tres Bien Salon in New Haven, CT. Since my time mentoring under the incredible, international photographer Sue Bryce, I have been captivated by her portraits of dancers. I've known Heather and her girls for many years now and they graced the studio recently with their poise, quiet smiles and pointe shoes. When Heather said she would love to come and have some portraits done, I was thrilled. The girls have been dancing since they were little and their grace was so lovely to photograph. Here are some of their images including the girls "before." Hair and makeup by Traci Bellinger of Tres Bien Salon. "I never thought I would fall in love with photographs of myself..."
Caitlin is a lovely soul, inside and out. She is a wife and busy, working mom of two young boys who are always on the go. Young moms don't usually have the time to pamper themselves so when I offered her an opportunity to come in to the studio 9 months ago, she said yes. And then she second guessed if she wanted to. She wrestled with the idea of it for 9 months. Finally, last month, she said to me, "You know, I've had to take the time to wrap my head around this idea. It's a little out of my comfort zone. I wasn't sure it was for me but I loved the IDEA of it. I had to get past my own block in my head." And get past it she did! Caitlin was open to trying new looks so we rented her two amazing dresses from Rent the Runway. We planned out her wardrobe, how she would wear her hair, and how she would choose clothes from her own closet to best suit her. She even indulged me as we set up a gorgeous flower bed. Throughout the shoot, she was bubbly, relaxed and enjoyed being pampered. She never worried about how to pose because I assured her and guided her every step of the way. That's MY job as her photographer. Two weeks later, during her reveal, she was teary as she watched her behind the scenes video. And when she saw her portraits for the first time in print, she said she was "overwhelmed". "I never thought I would fall in love with pictures of myself." she said as she continued to stare at her images. It was the best compliment I could ask for. Thank you Caitlin, for trusting me and showing you yourself again. All hair and makeup by Traci Bellinger of Tres Bien Salon. Oh my gosh, those smiles! Any devoted dog owner will tell you that pets are family. Tara's sister contacted me about doing a shoot out on location with her dog, Finn. I immediately could tell these two were made for one another. He, in true Golden Retriever fashion, was eager to please and spent much of his time right near his loving owner. Looking at these pictures, their affection for each other is obvious. It was such an honor to capture them! As women we are many selves...sometimes all in one day! Who are you today? Multi-generational photo shoots are just the Best! The sweet interactions, the family chemistry and their devotion to each other. The Goldsteins gave me this privilege after Thanksgiving. They were gathered for a short time and wanted me to get what Sue described as a "good family picture". We spent time at Harkness Park walking the beach and strolling through leaves. Sue and Steve's beautiful granddaughter stole the show. I was thrilled to be able to capture not only that family portrait but some amazing connections of a new nuclear family, a fun loving couple, and ultimately a Multi-generational Legacy Portrait that they will cherish for years to come. Do you have Legacy Portraits of your family? Isn't it time you did? One of the common objections I hear about doing a photoshoot is"Oh, I don't have anything to wear!" I just love these last images of Alex. It shows how you don't need fancy clothing to achieve beautiful images at your photoshoot. Think you don't have anything to wear? Did you know as part of your session fee, we offer wardrobe consultation, including coming to your home and helping you choose the best pieces for your session? We take care of it all. You just come and be yourself. How do YOU dream of being photographed? Hair and makeup by Traci Bellinger of Tres Bien Salon. One of the most amazing things that happens during a photoshoot is I get to capture the many sides of a woman. Don't you dare pigeon hole her into one type! We are many women: romantic, sassy, serious, sweet and tough as nails. 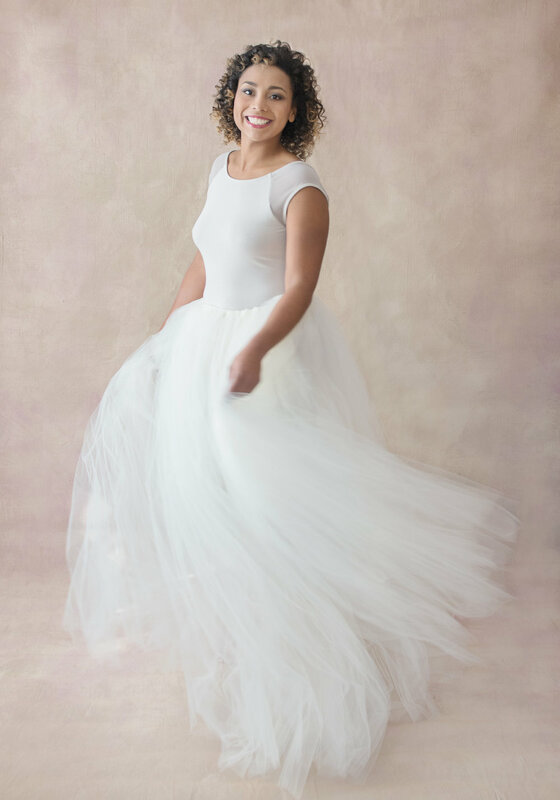 I had a vision of softly blurred images running through my head, so Traci and I set out to make this gorgeous tulle skirt. Now I'm slightly addicted and am ready to take on the next one. Alex loved it and so did we. Hair and makeup by Traci Bellinger of Tres Bien Salon. The wait is over for Alex's images! There is something that speaks to me about black and white photography. In my opinion, when you strip away the color, you're left with a more soulful image. Alex, Traci and I shared a lot of laughs the day she came for her shoot. I hope I was able to capture her fiery spirit as well as her softer side. This is the first of three posts to show you her images. Thanks to Traci Bellinger of Tres Bien Salon for amazing hair and makeup! When Meghan approached me about photographing her doing yoga poses around the city of New London, I was immediately intrigued. I was quickly reminded as we traveled around, that New London is a diverse, culturally rich city with many hidden treasures and iconic places. We hit many of them and you will see an eclectic mix in these photographs. The people in New London were curious about the girl doing yoga and the girl with the camera as we made our way past murals, churches, photographs, and amazing architecture. I even found myself lying on the floor of the New London Train Station (hey - anything to get the shot!). When Meghan saw her photos, she was thrilled. In her words, "Each photo was so special because each told a hidden story-the history behind each place, my union with each pose, the story behind how each image came to be....Each photograph help so many treasures and memories. And each spot that we shot now holds a more special place in my heart. Thank you!" "Thank you Kelley! This experience was so much more than I expected." Paula came in for her photo shoot to gift her fiance some beautiful photographs. She got more than she bargained for in all the best ways. She was pampered with professional hair and makeup by Traci Bellinger of Tres Bien Salon, several wardrobe changes, light snacks, and a fully guided photo shoot. A week later when she saw her images for the first time, she was so excited to gift them to him this weekend. What will you gift that special person in your life? With the holidays around the corner, the time to start thinking about it is now. You aren't just gifting beautiful images to cherish, you are gifting a full pampering experience for the one you love. Here are some of Paula's photographs including her "Before". Isn't she lovely? why does my child look purple? Why hire a professional photographer to take your picture? Here is just one reason: wonky colors. Take a look at the image below by photographer Lindsey Surber to illustrate this point. What do you notice? Hopefully, you can see there is a big difference in the baby's skin tone. Printing through your photographer, who uses a professional lab, will result in a baby (or anyone else) who looks like they should rather than jaudiced, sunburnt, or even purple. The other difference is the background color. A professional photographer will take the time to make sure your images are toned correctly so they are beautiful and will last a lifetime. Professional photographers will also work with their lab to calibrate the image they see on their screen with what the lab sees on their screen. So you know it will be correct, and if it's not for some reason, your photographer will fix it before it ever reaches you. That's ONE of many reasons you hire a professional. Your family's images are priceless and will be passed down for generations. Why would you trust those to anyone but a professional? This photograph of Heather's son, Zander, is the most powerful in this blog post. Because I have STOPPED TIME for him. I have given him portraits of his mom. Portraits that will outlive his parents. These are photographs that he will go look for someday of his beautiful young mother. How amazing is that? What photographs will your children find when they go looking? Here are some of what Zander and Mackenzie will find. Hair and Makeup by Traci Bellinger, Tres Bien Salon in New Haven, CT. It's time to create beautiful portraits for your family. Contact me at kelley@kelleynorcia.com or call me. 860-287-0443. Book before September 1 and receive a $100 voucher toward your prints. Want your photo session in the fall? No problem. You can still use your voucher when you reserve a date by Sept 1. Here is our journey of my office and studio renovation. The space you will be seeing used to be a dark, gloomy formal living room with 1970's wallpaper, stained green carpet and dark trimmed walls and windows. I couldn't WAIT to rip it all out! I absolutely could not be realizing this dream without him. His support, unmatched carpentry skills and vision have made this possible. All renovation work done by Built by Alpine, my husband's business. Please make an appointment to come have beautiful photographs taken. Isn't it time you loved seeing yourself in photographs? When was the last time you had a beautiful photograph taken with your mother or daughter? One day your children will go looking for photographs of you. What will they find? I recently had the honor of photographing these two amazing women. Mary and Jules came to the studio excited about the opportunity to have their portraits taken. We started with hair and makeup and discussed ideas for wardrobe, posing and mood. I guided them through it all and they trusted the process. At their Image Reveal this week, they were thrilled with their photographs. but we loved that Kelley captured our spirits!" Mary and Jules "Before and Afters"
"You truly gave us a gift that we will treasure." So often we are the ones taking the picture and never get in front of the camera. If you would like to experience photographs of yourself that you will fall in love with, call me and let's set the date. I promise, you will see yourself in a whole new way. It was a quiet summer night in June when I met Caitlin and her family at the beach. What touched me most about this family was the patience and attentiveness Caitlin and Scott showed their boys. With a toddler and active 4 year old, things were kept easy going and carefree. And this made for the best photographs to capture authentic connection and love. Enjoy. Kelley Norcia Photography is now offering Luxury Portrait Sessions in our Clinton, CT Studio. Your session will include a Wardrobe Styling Consultation, Professional Hair and Makeup, a Fully Guided Photo Shoot, a Portrait Reveal and Order session, full Retouching of your best images, and a Beautiful Studio atmosphere. Please contact me for full pricing, availability and details. Recently, my good friend Traci came to experience it for herself. Traci owns and manages Tres Bien Hair Salon in New Haven, CT. Go check her out! Traci will be doing Professional Hair and Makeup for my portrait clients and I am so honored to have her as part of the team! When Traci came to her Reveal appointment this week, she was so excited. She stood back and said, "This is me? These are the best pictures I've ever seen of me!" She was all smiles and it made me feel terrific to give her this experience. Here are some of her photographs. I hope you love them as much as she does. At her Photo Reveal Session this week! Kelley Norcia Photography can be reached at 860-287-0443. Booking now. You know that feeling when you know the sky is going to be just beautiful for a sunset? Well, we completely lucked out. We waited and as the night went on, it became more vibrant and intense. This lovely family was as beautiful as the sky. I hope you enjoy their photographs. If you are interested in a family or portrait session with Kelley Norcia Photography, please contact us at 860-287-0443. We would love to photograph you and those you love.